" Fate of Democracy in Hands Of the Electorate Following Recent Election Law Victories	"
The good news is that over the past week two federal courts struck down multiple provisions of GOP-enacted voter suppression laws in Wisconsin and North Carolina. The cautionary news is that the rejection of 21st century Jim Crow-style disenfranchisement at the polls, and, indeed, the fate of democracy itself, may well now hinge on the outcome of the 2016 Presidential election. The prospect of a Donald Trump presidency does not merely, as suggested on a recent BradCast by The Nation's John Nichols, portend a descent into fascism and "madness." A Trump victory would permit Republican-appointed Supreme Court "radicals in robes" and their anti-democracy agenda to recapture the majority status they lost last February with the passing of the late Supreme Court Justice Antonin Scalia. If we confirm a nominee who has not demonstrated a commitment to core constitutional values, we jeopardize our rights as individuals and the future of our nation. We cannot undo such a mistake at the next election or even in the next generation. In the first voting rights case to see a ruling come down last Friday, North Carolina NAACP v. McCrory, the good news is that a unanimous three-judge panel of the U.S. 4th Circuit Court of Appeal struck down as unconstitutional a comprehensive GOP voter suppression scheme that the court determined had been deliberately designed to have a retrogressive impact on the right of African-Americans to participate in electoral democracy. The state Republican legislature's scheme, the court held, was specifically designed to "target African-Americans with almost surgical precision." The bad news, however, is that over the past three years --- a period that included the 2014 midterm election and this year's primary elections --- this unconstitutional scheme was the law of the land in North Carolina only because a cabal of five Republican-appointed Supreme Court Justices gutted a key provision (Section 5) of the Voting Rights Act (VRA). That section required pre-clearance from either the U.S. Department of Justice (DoJ) or a three-judge U.S. District Court panel before election restrictions of the type enacted by NC could have implemented. In arriving at their decision, the 4th Circuit judges rejected as "clearly erroneous" the factual findings of a George W. Bush-appointed U.S. District Court Judge who had previously upheld this racially motivated scheme's constitutionality. In the second case last week, One Wisconsin Institute v. Thomsen, the good news is that U.S. District Court Judge James D. Peterson, after a full trial on the merits, struck down as unconstitutional eight (8) specific aspects of eight (8) election laws that were enacted after the election of Wisconsin's Republican Governor Scott Walker and Republican majorities in both houses of its state legislature. The bad news is that a previous decision handed down by Republican appointed "radicals in robes" on the 7th Circuit Court of Appeal --- a decision that became final after the Supreme Court declined to hear the case --- prevented Judge Peterson from reevaluating the constitutionality of a strict polling place photo ID law in WI even though his honor acknowledged that, in seeking to remedy the phantom menace of in-person voter fraud, Republicans had created "a cure worse than the disease." There are a number of reasons why Brad Friedman was correct when he described the 4th Circuit's decision in North Carolina NAACP as a "landmark federal voting rights ruling." 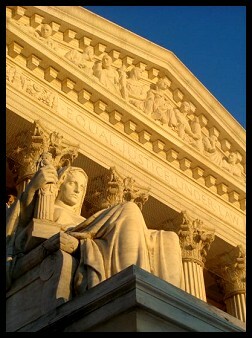 Perhaps the most important reason can be found in the appellate panel's meticulous analysis of the facts that gave rise to the finding of discriminatory intent --- a finding that reinforced the blistering criticism leveled at the Supreme Court's majority by way of Justice Ruth Bader Ginsberg's erudite dissent in Shelby County, Alabama v. Holder (2013), the controversial decision in which the activist "radicals in robes" saw fit to gut the key section of the VRA. In her dissent, Ginsberg took aim at the core assumption made by the Shelby County majority, to wit: that increases in African-American voter participation during the period in which Section 5's preclearance mandate was in effect (1965-2013) suggested that preclearance was no longer needed to protect minority voting rights. "Throwing out preclearance when it has worked and is continuing to work to stop discriminatory changes," Ginsberg observed "is like throwing away your umbrella in a rainstorm because you are not getting wet." The 4th Circuit's analysis revealed that North Carolina had been and continues to be a "racially polarized" state in which "the race of voters correlates with the selection of a certain candidate or candidates." Indeed, "in the years following President Obama's election, areas of the country formerly subject to §5 preclearance have seen an increase in racially polarized voting," according to the decision. In a context in which most African-Americans vote Democratic while a significant majority of North Carolina's white population votes Republican, polarization, the panel observed, provides "an incentive for intentional discrimination in the regulation of elections." Significantly, the panel held that "targeting a particular race’s access to the franchise because its members vote for a particular party, in a predictable manner, constitutes discriminatory purpose." Where the Supreme Court, in Shelby County, assumed that the need for §5 preclearance had waned, the 4th Circuit decision noted that between 1980 and 2013 the DOJ "issued over fifty objection letters to proposed election law changes in North Carolina." During that same period "private plaintiffs successfully pursued fifty-five (55) successful cases under §2 of the Voting Rights Act," the 4th Circuit panel observed. The Supreme Court's decision to gut §5 preclearance in Shelby County was akin to unleashing a pack of race conscious rabid dogs. Immediately after the five Supreme Court "radicals in robes" announced their decision, North Carolina Republicans "announced" their intention to enact an "omnibus" bill that, in addition to imposing polling place photo ID restrictions, curtailed early and out-of-precinct voting, and cancelled the state's successful program for same day registration. There were multiple factors, such as the breadth of the new restrictions and the alacrity of the Republican response to Shelby County that support the racially motivated conclusion. The most telling feature can be found in that fact that, in each instance, the Republican legislature obtained data reflecting the extent to which each provision of the proposed "omnibus" bill would likely have a disparate and retrogressive impact on the voting rights of African-Americans. Then, instead of seeking to protect those rights, the Republican legislature utilized what the 4th Circuit panel describes as "surgical precision" to maximize the adverse impact upon African-American voting rights by "eliminating the tools African Americans had used to vote and imposition of a new barrier at the first opportunity to do so." For example, the Republicans obtained data that showed that a disproportionate number of African-Americans do not possess one of the narrow range of state approved photo IDs. The Republican legislature also learned that very few African-Americans cast absentee ballots as compared to the relatively high percentage of white North Carolinians who do. While there have been instances of absentee voter fraud, the record revealed that North Carolina has never had so much as a single prosecution for in-person voter impersonation --- the only type of voter fraud that can be prevented by polling place photo ID restrictions. Yet, the Republican legislature saw fit to enact a strict photo ID requirement only for in-person voting. The predominantly white absentee voters were exempted from the photo ID mandate. One Wisconsin entails a legal challenge to multiple aspects of eight separate election measures that were enacted by a Republican-controlled legislature and signed into law by Gov. Walker, "none of which make voting easier for anyone," according to Judge Peterson. As previously noted, while prior appellate rulings prevented him from reevaluating the question of whether Wisconsin's photo ID law violated both the VRA and the U.S. Constitution on its face, those rulings did not prevent him from ruling on an as-applied challenge to the ID Petition Process (IDPP) as administered by Wisconsin's Department of Motor Vehicles (DMV) --- the very process that Republicans cited in the prior cases to negate allegations that the photo ID law had a disparate retrogressive impact on racial minorities. Mrs. Smith has lived in Milwaukee since 2003. She was born at home, in Missouri, in 1916. In her long life she has survived two husbands, and she has left many of the typical traces of her life in public records. But, like many older African Americans born in the South, she does not have a birth certificate or other documents that would definitively prove her date and place of birth. After Wisconsin’s voter ID law took effect, she needed a photo ID to vote. So she entered the ID Petition Process (IDPP) at the Wisconsin Department of Motor Vehicles (DMV) to get a Wisconsin ID. DMV employees were able to find Mrs. Smith’s record in the 1930 census, but despite their sustained efforts, they could not link Mrs. Smith to a Missouri birth record, so they did not issue her a Wisconsin ID. She is unquestionably a qualified Wisconsin elector, and yet she could not vote in 2016. Because she was born in the South, barely 50 years after slavery, her story is particularly compelling. But it is not unique: Mrs. Smith is one of about 100 qualified electors who tried to but could not obtain a Wisconsin ID for the April 2016 primary. I am persuaded that this law was specifically targeted to curtail voting in Milwaukee without any other legitimate purpose. The legislature’s immediate goal was to achieve a partisan objective, but the means of achieving that objective was to suppress the reliably Democratic vote of Milwaukee’s African Americans. 8. The prohibition on using expired, but otherwise qualifying, student IDs is unconstitutional under the First and Fourteenth Amendments to the United States Constitution. If we value democracy and abhor Jim Crow, there is only one way we can put a stop to this. We must defeat Donald Trump and Congressional Republicans like House Speaker Paul Ryan (R-WI), who have blocked a restoration of the full Voting Rights Act. UPDATE: On Monday U.S. District Court Judge Daniel Hovland issued a temporary restraining order preventing implementation of North Dakota's polling place Photo ID law upon the grounds that it imposed substantial and disparate burdens on the right of Native Americans to exercise the franchise, according to The Washington Post. The plaintiffs, Hovland noted, "presented undisputed evidence that more than 3,800 Native Americans may likely be denied the right to vote in the upcoming general election in November 2016" absent the issuance of the injunction. The case represents the latest example exposing the utterly baseless GOP claim that polling place photo ID restrictions are needed to combat voter fraud. "Voter fraud in North Dakota has been virtually non-existent," Hovland wrote, adding that North Dakota Republicans "produced no evidence suggesting the public's confidence in the electoral process would be undermined by excusing those voters who cannot reasonably obtain an ID." If there was a shortfall in Hovland's decision it lies in the suggestion that the state need only allow for the filing of an affidavit or declaration as an alternative to photo ID laws. Photo ID is, at best, a solution in search of a non-existent problem. Its purpose, pure and simple, is the unnecessary disenfranchisement of Democratic-leaning voters --- often, as in the case of Texas, quite successfully. Ideally, our courts should end the implementation of all polling place photo ID restrictions for the same reason that we ended the poll tax. UPDATE 8/3/16: As anticipated, North Carolina filed a Motion with the 4th Circuit Court of Appeal seeking a stay of the appellate court's injunction barring enforcement of its "omnibus" election law pending a petition for a writ of certiorari before the U.S. Supreme Court. The principal basis for the request is based upon what is known as the "Purcell principal" --- the notion that chances in election laws should not be ordered too close to the election. U.C. Irvine Law Professor Rick Hasen anticipates that the 4th Circuit will likely deny the stay and that the Supreme Court will likely deny the emergency petition because "there are no longer five justices willing to uphold restrictive voting laws. Hasen's analysis reinforces why it is critical that Trump be defeated. « PREVIOUS STORY "The Mixed Bag that is Hillary Clinton; the D-Bag that is Donald Trump: 'Bradcast' 8/01/2016"
"Fate of Democracy in Hands Of the Electorate Following Recent Election Law Victories"
The Supreme Court's decision to gut §5 preclearance in Shelby County was akin to unleashing a pack of race conscious rabid dogs.